Not the first Porsche to catch the ire of purists – there have been plenty of them to date. But the first Porsche to really, REALLY throw people for a loop. Even the 928 (a V8-powered, rear-wheel drive beast) didn’t raise as many hackles as the Cayenne did. Some people just couldn’t get over the fact that Porsche, the company dedicated to upholding its racing heritage and honoring its storied past on the race track, would build an SUV. But build it they did. And man, did they sell. 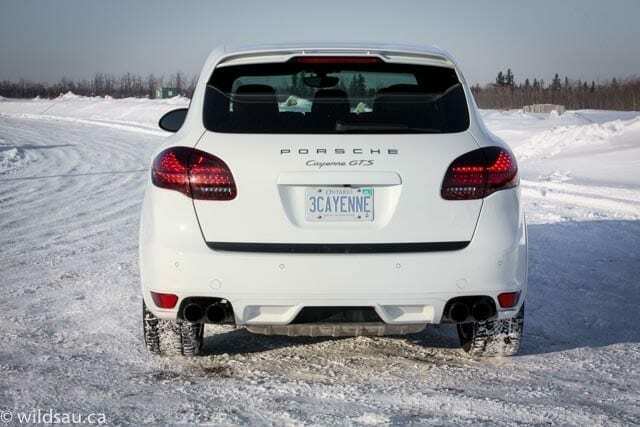 Porsche has sold bushels of Cayennes, and whether you like them or not, and whether you think they are a turn of the knife in the back of this great sports-car company, they bring in a LOT of money. I’m here to tell you that, if you’re one of those that still shake your head at the concept of a Porsche SUV, it ain’t all bad. Frankly, it’s mostly good. Much of it, in this case, is incredibly good! 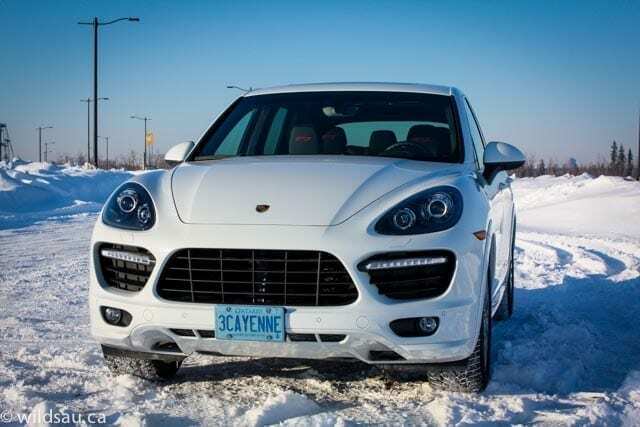 The Cayenne GTS starts at $93,600. Add the options that Porsche chose for my review vehicle, and you’ll be parting with $120,225. Some of the options are appearance-based goodies, such as the $4170 Black kit, and the $3940 Carmine Red interior package. Yep, there’s the $1560 21″ wheel package, the $1360 sunroof, the $4200 navigation system, and even the $6500 Burmester sound system upgrade. Amongst other things. For the record, the GTS slots in above the base, diesel and S trims, and below the Turbo and Turbo S.
The Cayenne GTS is Porsche’s fastest normally-aspirated Cayenne. It benefits from Porsche’s wonderful (soon to be put out to pasture) V8. But not the one you’ll find in the Cayenne S. This one has been massaged. 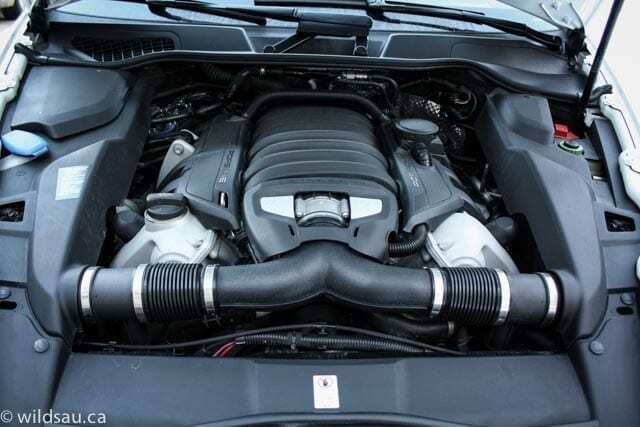 It’s a 4.8-litre V8. It makes 420 horsepower at 6500 RPM. And 369 lb.ft of torque at 3500 RPM. That will sound familiar – much like the Panamera GTS I reviewed not long ago. The biggest difference between the two drivetrains (on paper) is that the 8-speed automatic in the Cayenne here is a Tiptronic, which is a lovely transmission to be sure, but nothing like the ridiculously ethereal and competent PDK dual-clutch in the Panamera. All that power makes its way to all four corners through an all-wheel drive system. Fuel economy seems like a silly concept to discuss, but I’m all about being silly. The Cayenne GTS is rated at 14.2 L/100 km (17 mpg) in the city and 9.6 L/100 km (25 mpg) on the highway. During my week with it, in fresh snow and cold temperatures, I averaged a slightly lower-than-rated 19.7 L/100 km (12 mpg). How was I driving it? If you have to ask, you don’t know me very well. Good thing for the 100 litre tank then. I’ll say it. 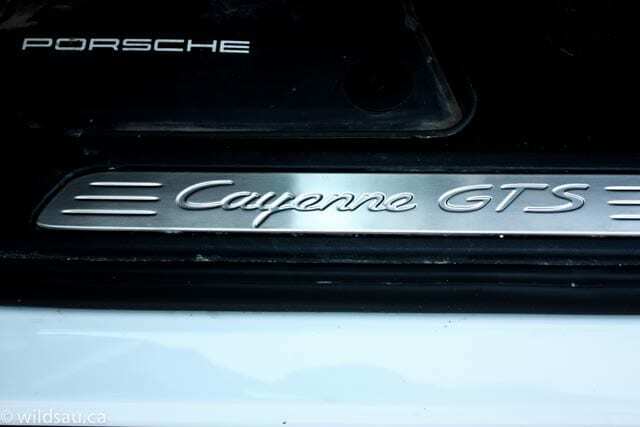 I wasn’t a fan of the Cayenne styling. Until this generation came around. It’s still not beautiful, but it’s so vastly improved, in my opinion, that I no longer think it’s ugly. I feel that it is a significantly tidier and more organic look than before. The GTS gets a few extra touches – like the DOUBLE rear spoiler which is of course ridiculous. It also gets side skirts, wheel arch extensions and different front and rear fascias. The LED tail lights are blacked out, the headlight lenses look smoked out. 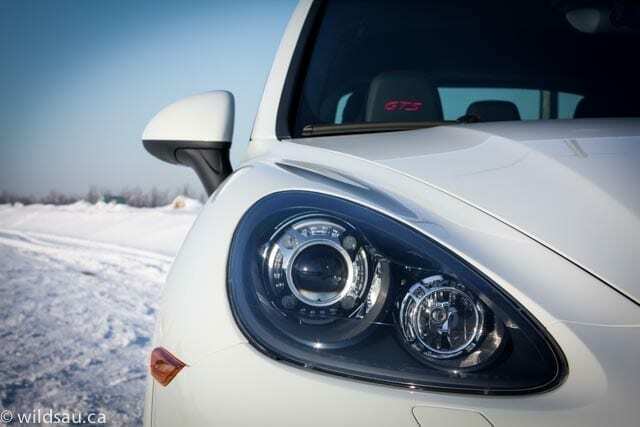 The grille looks like an enormous carp that’s coming after you, and the wheels are huge – with Porsche’s red brake calipers peeking out for good measure. Speaking of good measure, there are 275-sized tires – all the way around. The Cayenne is wide, to be sure, but somehow the new styling comes off as taller and narrower than before, giving it a bit of a hunchback profile from the rear. I think that’s more of an optical illusion than anything else though. A couple of details that continuously caught my eye. 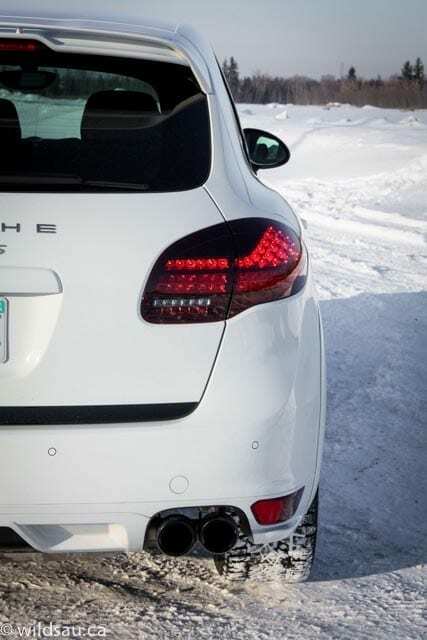 As a guy who appreciates a vehicle that doesn’t make excuses for having a powerful engine, I loved the massive matte black quad exhaust tips. They are perfect for this vehicle. And I also liked the 4 tiny but super bright LED driving lights that are placed around the rim of the headlight itself. When it’s coming toward you, you just see 4 bright dots on either side. Oh, and of course the strip of LED lights below in the side intakes flanking the grille. Although it’s a collaboration of over the top elements, everything works in concert and it’s a good looking SUV. 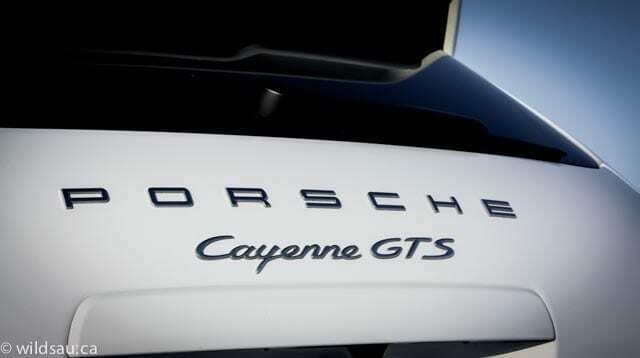 I loved the Panamera GTS, and yes, I loved the Cayenne GTS. It starts when you fire it up. It barks to life. It’s best when it’s backed into a parking spot, against a wall. So you can hear the sound of the V8 reverberate against the wall. EVERYone around you looks. That’s a guarantee. Snick it into gear, and it rewards you with smooth, buttery power from the get-go. This is a very easy vehicle to drive. It’s comfortable. 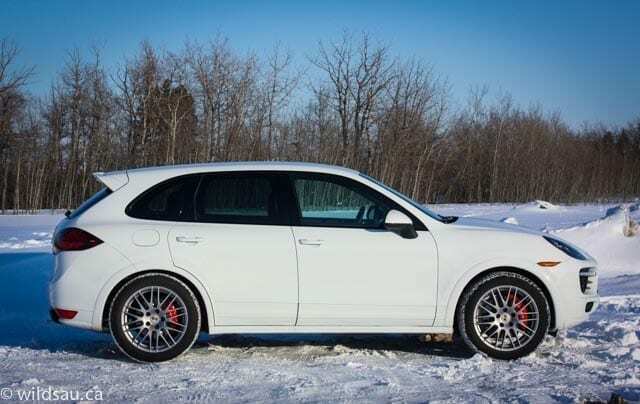 The ride is fantastic – yes, it got a bit too firm for everyday driving in Sport mode, but then again, I live in Edmonton. Where you need off-road capability just to climb out of some of the potholes. I thought normal mode was perfect. There’s also comfort mode, for old people. 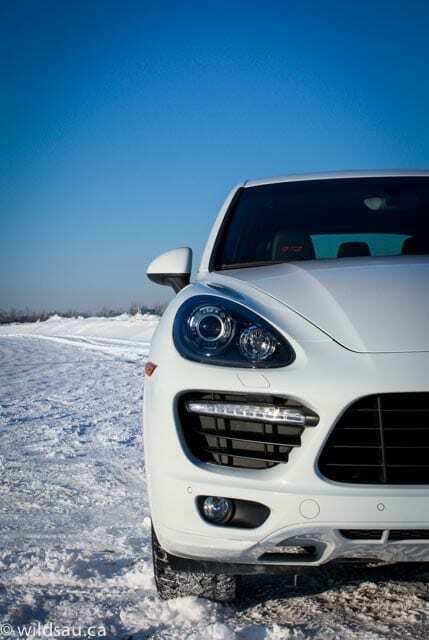 For all the comfort it offers, the Cayenne’s real talent shines when you start pushing it. 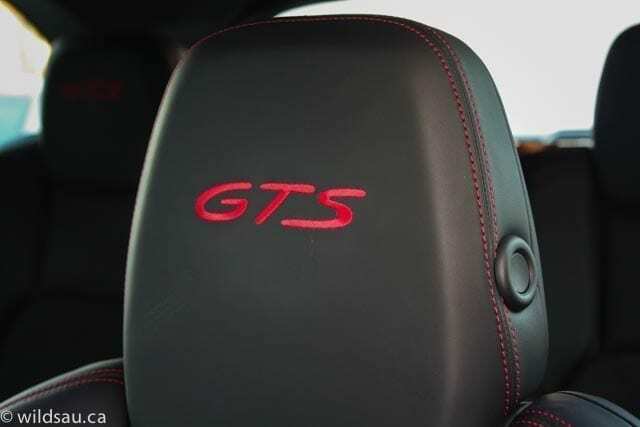 The handling capabilities of the GTS are simply stunning. I mean, it’s ridiculous. I have driven sports cars – cars that are marketed toward lead-foot teens because they’re sporty – that don’t handle as well as this SUV. This tall SUV. With seating for 5. That weights 4762 pounds. That’s more than our minivan weighs. Suffice it to say, I’ve never driven an SUV that came close to the handling this thing offers. Is it fast? You bet. 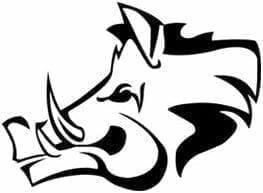 0-60 mph comes up in a scant 5.7 seconds. Flat out, the Cayenne GTS does 261 km/h. And it sounds better than anything else while it’s doing those things. The transmission is smooth – super-smooth. And a bit disappointing when you’ve had the opportunity to drive the same engine paired with the PDK. The PDK bangs off shifts as smoothly but much more quickly, and the manual shifts are slower here too. You can do the shifting yourself with the wheel-mounted paddles or with the Tiptronic shift lever. Frankly, I thought putting it into Sport mode was all I needed when I wanted to step it up a notch. So the transmission itself isn’t disappointing – it’s tremendous. But it’s not as good as the PDK is. The brakes, which are simply enormous, are incredible. The stopping power required to haul a porker like this down to speed is significant, and the GTS feels as though it has plenty of stopping power more than you’ll ever need. Is it quiet? Yes. Road noise and wind noise are exceptionally low at any speed. The engine is audible, but never intrusive. Step on it though, and you can’t miss it. But that’s the point here, isn’t it? The V8’s bellow becomes all the more urgent when you’ve depressed the Sport mode button. 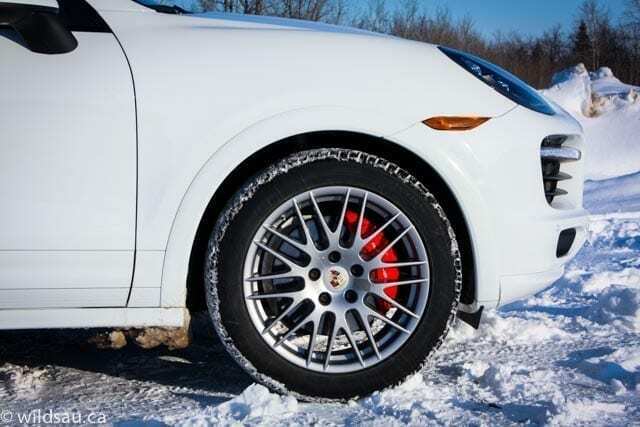 Sport mode sharpens the Cayenne’s responses. It remaps the throttle response and it holds the shifts longer. There are some other drive mode adjustments you can make. The differential can be programmed for off-road use, and can even be locked. There are five different ride heights you can choose. 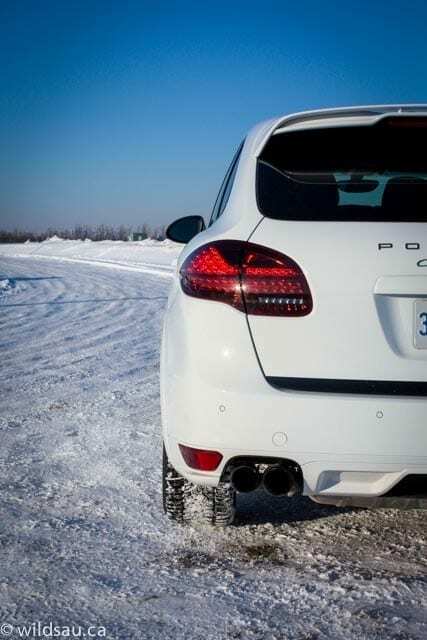 There’s hill descent mode for all the times you’ll take your Cayenne GTS off-roading. And of course, what would a modern Porsche be without the auto start-stop mode to save fuel? I never turned that “feature” on. Getting into the Cayenne GTS is, as with any modern Porsche, a celebration of fit and finish. The construction is spectacular, and I’ve always felt that a Porsche is put together like nothing else out there. I love the attention to detail. Materials are first-class. The dash is upholstered in gorgeous leather, with contrasting Carmine Red stitching. 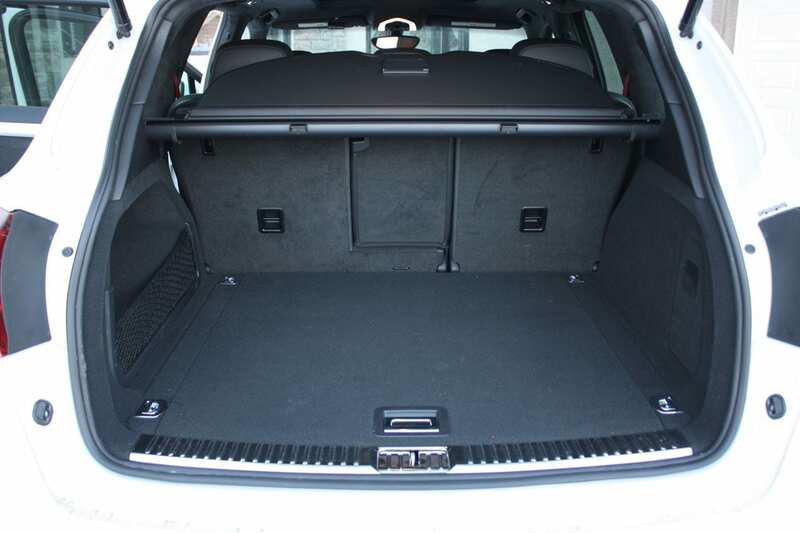 And you’ll find alcantara everywhere else – the headliner, the pillars, etc. Those seats – oh those seats. Once you get over the shockingly high thigh bolster and drop into them, they’re perfect. 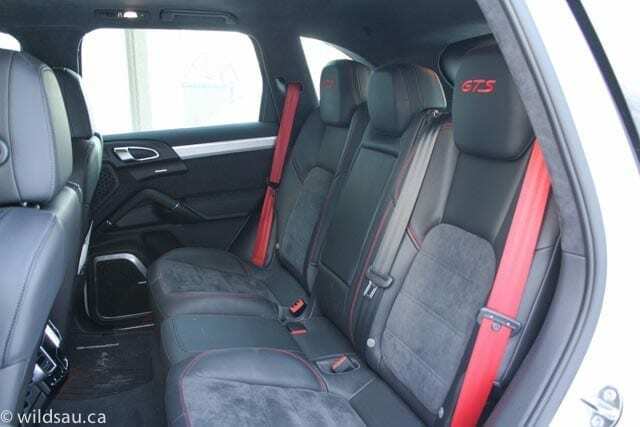 Although they offer exceptional bolstering and would be at home in any sports car, they are very comfortable. They’re heated, power-adjustable and the driver’s side has a 3-position memory. 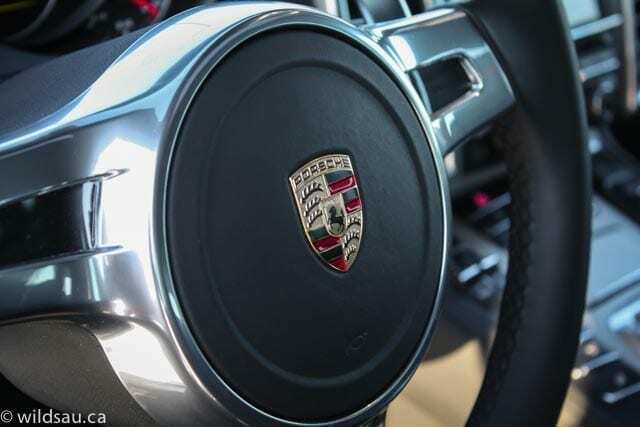 Porsche makes one of the most perfect steering wheels – this one is manually adjustable, and has no buttons or controls on it to distract you. In my world, that’s not exactly ideal. I do appreciate certain things on the steering wheel, especially the volume control for the sound system. Behind the wheel is the standard Porsche 5-gauge cluster – a big tach in the middle, and a round driver information screen second from the right. It allows you to see what’s playing on your media system, navigation instructions, the navigation map screen, your phone functions, trip meters, tire pressure readings or a sport chrono timer. The center stack isn’t very tall – it’s basically just a touchscreen with some hard buttons and knobs below it. The screen handles the navigation, media, phone functions and the back-up camera feed. 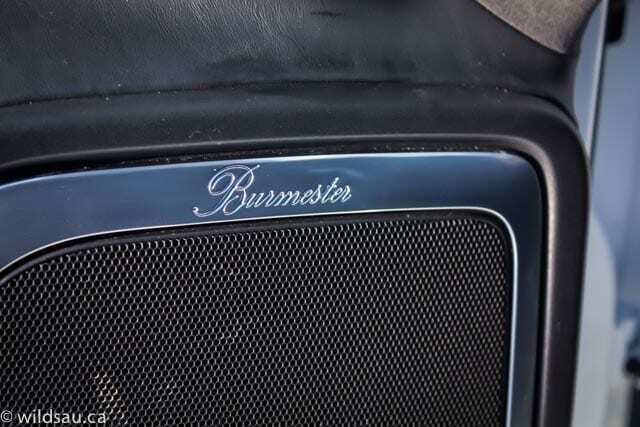 Speaking of the media system – this Cayenne had the upgraded Burmester system. It feeds off of AM, FM, CD, USB, auxiliary and Bluetooth streaming sources and man, does it ever sound good. It plays very loudly, and effortlessly hits the full spectrum of sound. One of the best systems I’ve heard in a vehicle. Is it worth over 6 grand? Of course not. But I’d check that option box off in a heartbeat! Below the stubby stack is the signature elevated console, a rising mess of buttons and overall, an ergonomic nightmare. I counted 46 buttons or switches on the dash and console. 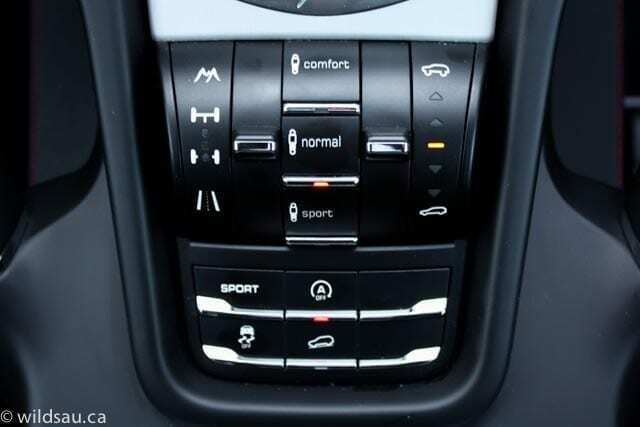 Ironic that Porsche chooses not to distract you with steering wheel buttons, yet forces you to use this sea of identically shaped, colored and sized buttons. Let’s just say that nobody could use any of them WITHOUT taking their eyes off the road. 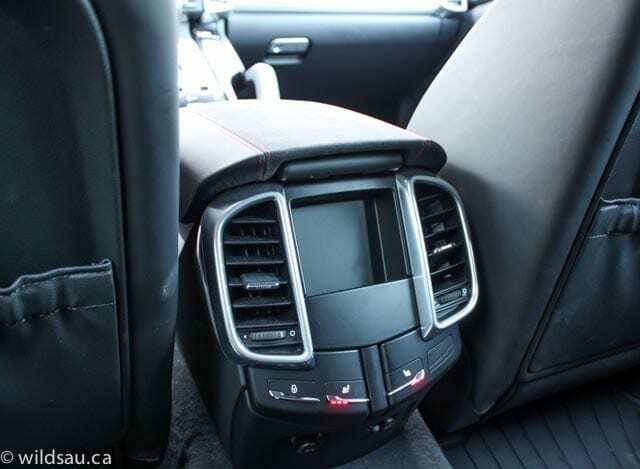 In terms of convenience and comfort, you get adjustable air vents and two 12V plugs at the back of the center console. There is a tiny (read: I’m not sure what you’d ever use it for) storage compartment that silently slides out of each door panel in the back. The middle seatback folds down to become an armrest with two cupholders in it. Our three children were very comfortable back there and there are two sets of LATCH anchors for kids’ seats. Another nitpick – no satellite radio to be found. That drives me nuts! A comfortable, quick, sporty driving experience. Plenty of interior space and cargo real estate. A quality built vehicle. On and off-road ability, though I question how many buyers will ever take advantage of the latter. The Cayenne GTS seems to do it all. If there is a legitimate context from which to consider a $120,000 SUV and you have the necessary means, this would be the one I’d pick.